A recent post, probably a borderline rant, grew from a National Register nomination for a house in Wichita, Kansas. 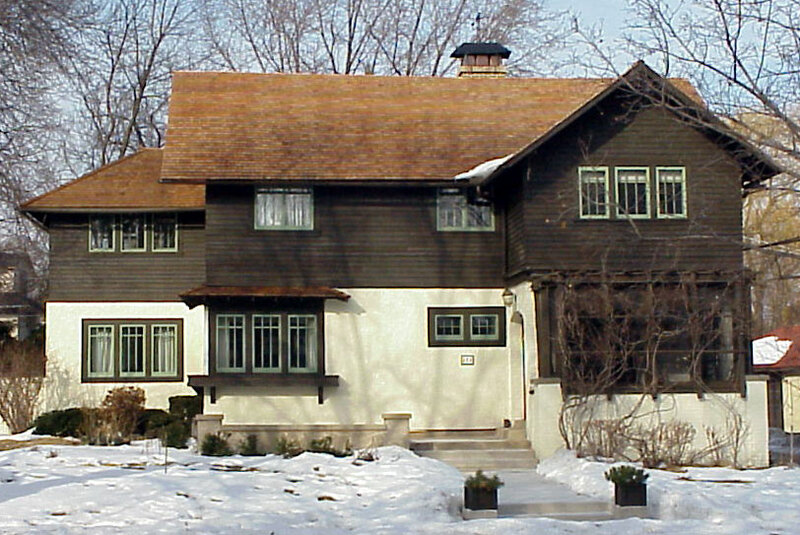 The Hugh Roberts house at 235 North Roosevelt is an excellent example of the Arts & Crafts style of the early 20th century and deserves its place on the Register. The description of the house is, like most nominations, formulaic and technical; don’t curl up with a nomination on a stormy night expecting a compelling story line. But the historical narrative is (for me, at least) far more interesting. In this case, I’ve got a horse in the race, as they say, and a special interest in the attribution of the building’s authorship. Simply put, who was its architect? The question naturally arises, What does an architect do? Any responses to that general question depend on your point of view. Clients, for example, are often heard to say, “Oh, I designed the building. The architect just drew up the plans.” Saturday newspaper supplements are rife with that perspective, along with the photo caption “artist’s conception” beneath the drawing of a proposed church, shopping mall, or apartment complex. Ask the architects of those projects — the professionals whose name and liability are on the line — and you’ll get a remarkably different answer. Since 1951, when Wyoming became the last state to regulate the practice of architecture “in the interest of public health and safety”, the profession has been governed by what are called “Title & Practice” laws. That is, architecture as a professional activity is limited by title (no one may use the word “architect” to describe themselves in the public arena, for advertising or in the classified section of the phone book) and by practice (the actual design of buildings — the preparation of drawings and specifications used in the construction process — the the range of building types or project costs limited by the law) and violations of either will result in legal action. In other words, without proper credentials, you are restricted from either calling yourself an architect or actually doing what an architect does (as described in the various state statutes). All of which begs the question, What does an architect do? Since my education prepared me for a career in architecture but I chose, instead, to teach others preparing for their own careers, my perspective is best described as “academic.” So, if this seems overly simple, I apologize beforehand. For most of the 20th century, the process of creating a building required three players in a triune relationship, much like the system of checks and balances among the three branches of our government. I label them “A”, “B”, and “C”: the Architect, the Builder, and the Client. The clients desire the building; the architect provides the design solution and construction documents (plans and specifications); and the builder (more often called a contractor) executes the plans under the architect’s supervision. The architect is the client’s technical advisor to ensure proper execution. But this three-way relationship leaves unanswered the matter of the design process itself. Am I on thin ice suggesting that Mr and Mrs Reeves, clients for the house in Oak Park, brought their dreams to Lawrence Buck — perhaps because they had seen another of his two Oak Park houses — asking him to design a home within their resources? The clients presented a list, perhaps, of spatial requirements, which Buck organized in ways appropriate to an upper middle class family. There would have been give and take between client and architect, until concensus was reached and construction documents went out for bids. Yes, the clients approved material choices and details, room arrangements and fenestration, perhaps even paint colors and some other interior aspects not strictly architectural; Buck had a long-standing relationship with two collaborators, d’Arcy Gaw and Mary Mower, as “The Crafters” offering interior design services. But the design, in part and as a whole, was the result of Buck’s creative vision and cumulative skill: he was “the architect” of the design. So, the Reeves design was published twice (as far as I know) in the pages of the LHJ and House Beautiful. An inexpensive set of plans was available from the LHJ, at which point three options presented themselves: #1) the client could have employed Buck himself to superintend construction — an expensive prospect, given the distance between Chicago and Wichita; #2) the client could have acted as his/her own general contractor, superintending construction themselves; or #3) the client could have sought a local “clerk-of-the-works” to oversee the construction process, someone who could be a contractor or even an architect (or someone using that title, since Kansas did not license the profession until 1949). Let me insert a local instance here in Fargo: In 1898 St Paul architect Cass Gilbert — subsequently architect of the Minnesota State Capitol and, later, the Woolworth Building in NYC — received the commission for the Northern Pacific Railway depot in Fargo, North Dakota. The drawings were produced by Gilbert and his staff in Saint Paul. A building of that size required daily, on-site supervision, which would have been an expensive prospect for Gilbert. So he contracted with local architects Hancock Brothers to be clerks-of-the-works. It was George or, more likely, Walter Hancock who took responsibility for interpreting the inevitable ambiguities of a complex design. If I were writing a National Register nomination for the N.P. Depot, however, it would never cross my mind to attribute the depot to Hancock Brothers as its architects. As the owner of a lumber yard, Wichita client H. N. Roberts could presumably have been his own superintendent, time permitting, but he might also have employed an architect for that task. What we don’t know is the authenticity of the design, that is, the degree to which Buck’s design remained intact. A local architect (or contractor, for that matter, since, remember, the profession was unregulated) could have altered the design in minor ways: relocating a door, reversing cabinetry or plumbing fixtures, but the likelihood of considerable modification is slim. Extensive changes negate the original choice of a design and, by implication, a designer. Until extensive modifications are documented, Lawrence Buck should be considered the architect of the H. N. Roberts house. U. G. Charles — if he was indeed connected with the project — was no more the building’s architect than Buck was its superintendent. If I sound angry, you may be right. I prefer to see it as chagrin, however; extreme disappointment that educated people, professionals, continue to misunderstand what “design” is and what “designers” do. I have a horse in this race, as they say, a couple of them, in fact; a truth I gladly admit. But my ire would be the same under other circumstances. By agincourtiowa in Uncategorized on Saturday/06/January/2018 .